If living well is the best revenge, you’re sure to find it in this beautiful custom-designed home in Hatteras by the Sea North. Chart your course to Queen Anne’s Revenge and prepare to board for the vacation of a lifetime. An easy access ramp to the ground level from the covered parking area and an elevator to all inside levels make this the perfect home for those with limited mobility. Hang out in the ground level game room with TV and wet bar with full-size refrigerator and freestanding icemaker, where you will enjoy hours of friendly competition at the pool table. A half bathroom is located off the game room. A king bedroom and a bedroom with a pyramid bunk and a single bed share a Jack-and-Jill bathroom. Both bedrooms open onto a shaded deck overlooking the native vegetation behind the home, where you can enjoy a secluded soak in the bubbly hot tub. All bedrooms throughout the home have TVs with DVD players. The laundry area with utility sink is also on this level. Four master bedrooms, each with deck access, are on the second level. Two king bedrooms with shower stalls in their bathrooms, one with fold-down seat, open onto the ship-shaped shaded deck on the front of the house. 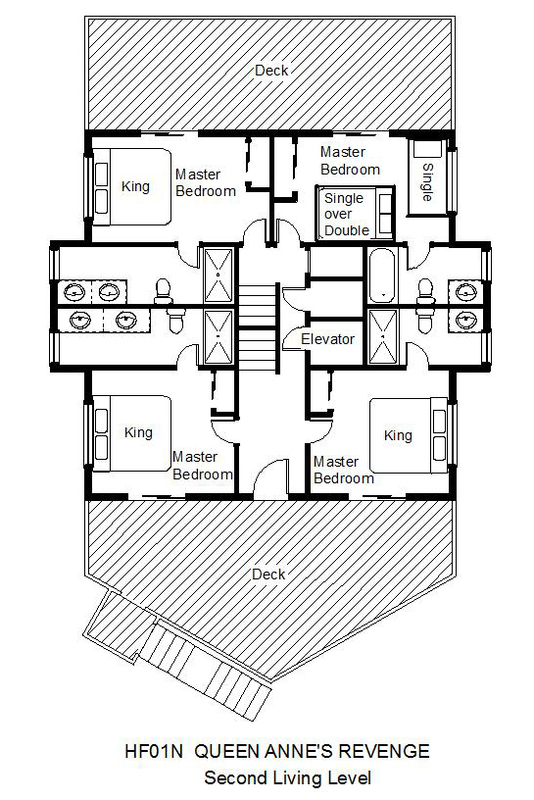 An additional king bedroom with shower stall in the bathroom and a bedroom with a pyramid bunk set and a single bed open onto the shaded back deck. Sleep in style in the spacious captain’s quarters on the top level, a king master suite with separate soaking tub and shower stall in the bathroom, which opens onto the rear sundeck overlooking Hatteras Village. Feast your hungry crew from the well-equipped galley with wet bar sink, table, and breakfast bar. The adjacent dining area features a ship’s helm-inspired wet bar area. Relax in the living area with cozy gas fireplace for off-season evenings or soak up some rays on the bow of this ship while taking in the ocean view. 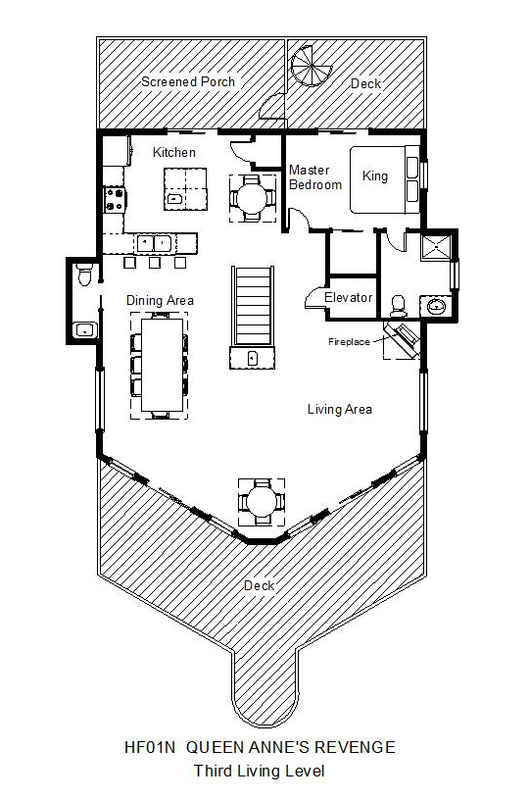 A convenient half bathroom is also on this level. Dine al fresco in the screened porch off the kitchen or head up to the crow’s nest sundeck for breathtaking sunrises and sunsets with views from ocean to sound over Hatteras Village. Come ashore and lounge by the private in-ground pool, or enjoy a cool drink at the cabana with wet bar sink and mini-fridge. Access to the community pool and scenic boardwalk through the salt marsh and wetlands is available just a few houses down. Hunt for buried treasure on the beach, with a community boardwalk over the dunes for easy access. Head to sea on an exciting fishing charter from one of the nearby marinas, or explore Hatteras Island’s maritime history in the Graveyard of the Atlantic Museum. Drive onto the free ferry to Ocracoke for a fun-filled day trip to the home of Blackbeard himself. For the landlubber, plenty of shopping, dining, and other fun activities are close at hand as well. Sail away from the cares of the world aboard the Queen Anne’s Revenge. Is there internet access or Wi Fi? Yes, all of our homes offer wireless internet unless otherwise stated in the description of the home. All of our properties are non-smoking unless otherwise stated in the description/listed amenities. Does the kitchen have a coffee maker and a blender? Yes, coffee pots and blenders are standard kitchen requirements for all of our homes. Do we need to bring our own beach umbrellas and chairs? Where is the beach access for Queen Anne's Revenge? It is across the street from the home. Is the pool heated? If so, what is the cost? Is there a fish cleaning table? No this home does not have a fish cleaning table. Is there an outdoor shower? Is there a fire ring outside? There is an enclosed outdoor shower. There is not a fire ring. The house is beautiful & very spacious for large families. It is in a quiet community with lots of privacy between houses. All of the rooms are nicely furnished & beds are comfortable. You have ocean views & the walk to the beach is not far. This is a great house for large family gatherings! 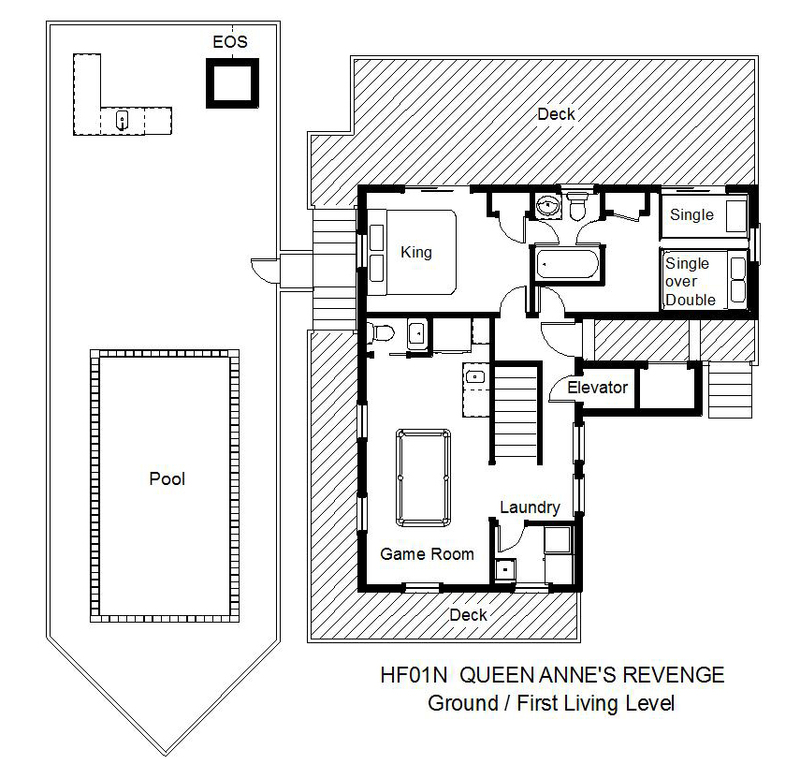 Queen Anne's Revenge is well worth renting. The owners take pride in offering their home to others for making special memories with family and friends. We were very happy that we rented QAR it met our expectations and then some. this was a great property. We had more kids than adults, so a second &#34;living room&#34; or space for the kids to hang out would have been perfect. Enjoy the view watching the sunset from the crows nest. Great house to spend with family and friends. We love staying at Queen Anne's Revenge with family, friends, relaxing by the pool after the beach, hot tub and watching the sunset from the crows nest.